COLOURS: If you require a bespoke RAL colour for your stair climbing sack truck you must state this in the comments field when ordering & we will contact you for details. Delivery times might vary. What is the purpose of this Steel Stair Climber Sack Truck? This stair climber sack truck from The Workplace Depot is the must-have item for transporting heavier items up and down the stairs, curbs and steps. 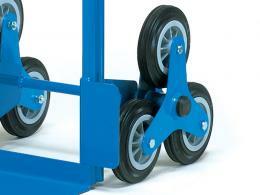 The rolling 3-wheel assembly enables the product to tackle stairs with no effort at all. Where can a Steel Sack Trolley be used? If you’re looking for a high quality, versatile and durable stair climber sack truck for your business, this is the solution. 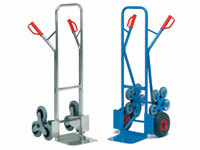 This product is essential for work environments where heavy materials have to be moved up and down stairs. Who might use a Steel Stair Climber? 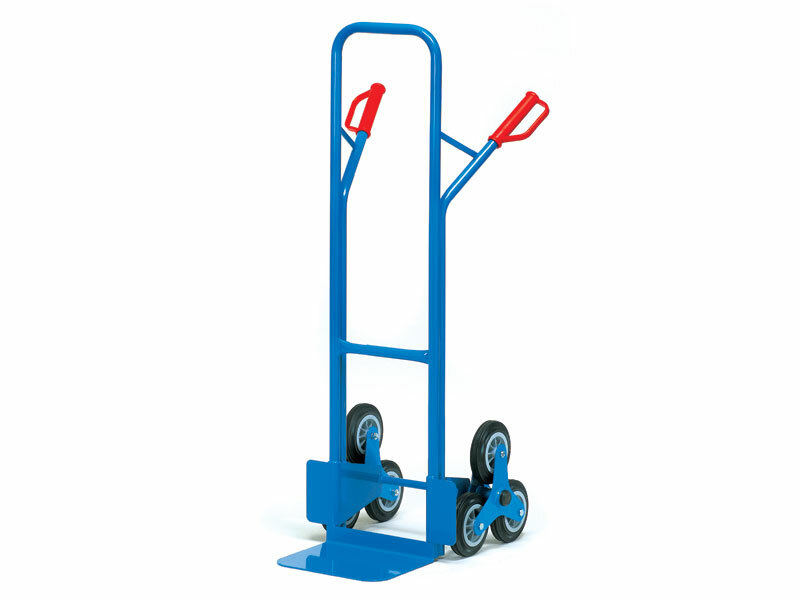 This stair climber sack truck is the perfect choice for both home and the workplace. It can handle a large loading capacity and the compact design makes transport and storage a complete breeze. Order this product today from The Workplace Depot and get free delivery within 10 – 15 working days. This is the perfect stairway truck for general purposes. The sturdy welded construction comprises a 320W x 250L or 480W x 300L footplate with 2 three-armed wheel spiders with 40 x 160mm solid rubber tyres. 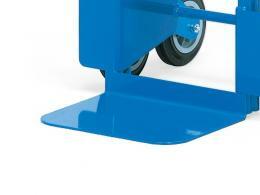 The product has a standard blue powder coated finish. If you would prefer a customised colour for your sack truck, simply say so in the comments field when placing your order and our sales team will be in touch to discuss this with you. All products at The Workplace Depot come standard with a one-year warranty on parts and labour and we offer a Price Promise to match any price. Please see our easy returns and exchange policies. If you have any queries, feel free to contact our customer service department. For your convenience we accept various forms of payment, including Maestro, Visa, MasterCard and PayPal.